ISLAMABAD, Sep 16 (APP): Pakistan Aeronautical Complex (PAC) showcased its spectacular aviation manufacturing, overhauling and repair capabilities at the African Aerospace and Defence Exhibition, AAD 2016, held at Waterkloof Air Force Base at Pretoria South Africa from September 14.
of Super Mushshak aircraft, which attracted major international players of aviation industry, as well as large crowd, a press release said. products of PAC very immaculately. Pakistan’s contingent was led by Air Marshal Arshad Malik, HI(M), Chairman Pakistan Aeronautical Complex, Kamra. 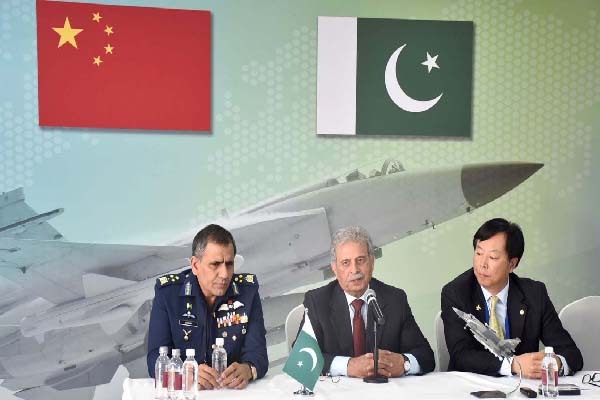 Yang Yin, President CATIC of China and Air Marshal Arshad Malik, Chairman PAC Kamra. dignitaries from various African countries to consider inducting the aircraft into their respective air forces.